The study of Aikido is open to any who would pursue it with sincerity. There are no absolute physical requirements, but routine practice will gradually allow you to participate in more vigorous techniques. Neither is any previous training in any martial art needed to begin. There is no scheduled curriculum; beginners will study along with the rest of the class, receiving instruction appropriate to their capacity. Visitors are always welcome. We request that visitors watch a class before participating in order to confirm their interest for themselves. Fitness sufficient for moderate, sustained activity. Strength, flexibility and coordination will enhance the practice of Aikido, but these qualities will be improved through training. Suitable clothing. Athletic clothing may be worn at first. Regular practice should be conducted in a dogi. Dogi for Aikido or Judo are acceptable. After the initial kyu test is passed, a hakama (pleated traditional pants) should be worn. Payment of the dojo fee. The dojo fee is $40 ($20 for youth) and is due at the beginning of each month. The fee allows participation in as many classes as desired, as long as the practitioner meets class requirements. Waiver of Liability. 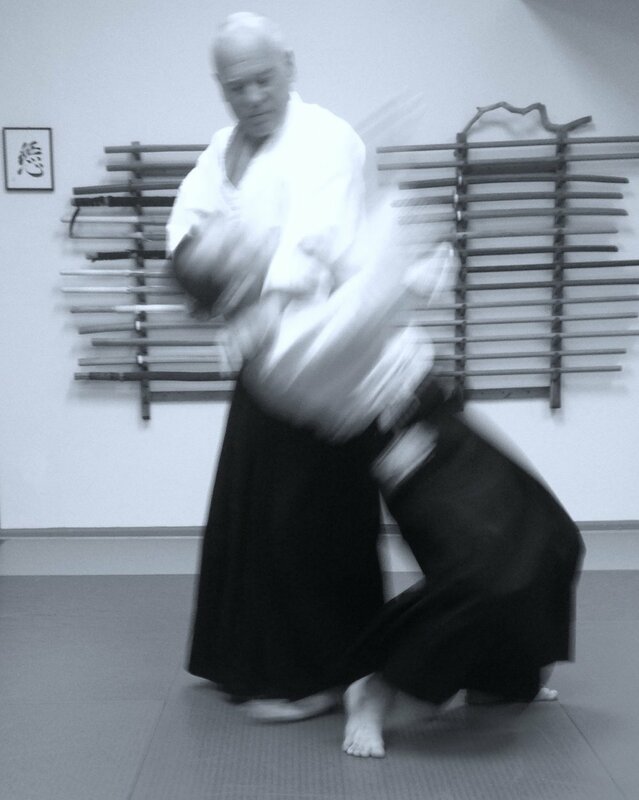 Aikido is relatively safe but it is a martial art. Participants must acknowledge the possibility of injury. Training tools. Aikido uses the bokken (wooden sword), jo (short staff), knife (tanto) and shinai (bamboo sword) to reinforce the principles learned in open-hand techniques. A limited number of these tools are available in the dojo for general use. Serious students will eventually acquire their own personal tools, but this is not necessary until much further training. Aikido training is shaped by its philosophy of harmony and blending. There are no competitions in Aikido. Practice focuses on the development of technical skills and awareness through repetition of techniques in a controlled environment to master the fundamentals of moving, timing and breathing. It is our objective to help you build a firm foundation in these fundamentals. This is done through both gentle and strenuous exercises. Most practice is done with a partner; each works at his or her own level, alternating the roles of Uke (attacker) and Nage (defender). Each role is examined to develop sensitivity and control. Wooden practice weapons - sword (bokken), staff (jo) and knife (tanto) - are used in training to better understand open hand movements. The final aim of our training is the development of an integrated mind and body - a Centered Person - who displays a confident and relaxed posture, can think clearly and calmly in moments of stress and conflict and react with the appropriate amount of force. All students train together on whatever technique the instructor wishes to demonstrate, regardless of experience. However, students are only responsible for knowing a subset of technique. This subset expands as students gain rank. Rank is achieved through testing. Testing is conceived as a demonstration of not only practical knowledge of technique, but also a still, receptive and decisive mind. Although there are minimum formal requirements for each rank (such as time), it is ultimately the decision of the instructor and the willingness of the student that determines when testing occurs. The instructor will recommend testing only when the student already performs required technique at the expected level of mastery. Ideally, the testing is really only a demonstration to recognize a stage of the student's development. Please see the ASU handbook to reference technique and terminology.